Did You Know | What is the difference between a car&#8217;s ex-showroom price and on-road price? Did You Know | What is the difference between a car’s ex-showroom price and on-road price? 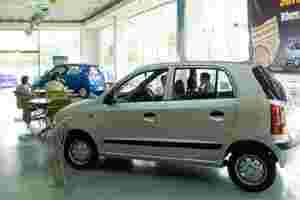 When you go to buy a car or a two-wheeler, one of the major criteria is the price of the vehicle. The salesperson at the showroom would quote two prices—ex-showroom and on-road. The price you actually pay for the car is the on-road price, so you better look at that when making your decision. The on-road price exceeds the ex-showroom by around 10%, depending on the car model and the state in which you are buying it. In some states and cities, ex-showroom price may also include octroi tax. This is the tax collected by the local authority for bringing articles from outside the region for consumption in that region. So while most advertisements give ex-showroom prices for Delhi, if you are in some other state or city, it’s best to check the ex-showroom price applicable there. For instance, ex-showroom prices are higher in Mumbai than in Delhi. On top of the ex-showroom price, you need to pay a lifetime road tax, a registration charge, insurance charge that is renewed periodically and logistics charges. Logistics charges include the cost for transporting the car from the warehouse to the showroom, the number plate charge and sundry expenses. In short, on-road price is at which the dealer would hand over the keys of the vehicle to you. Which price do banks consider? When you buy a car through bank finance, these charges become important. The bank finance option is available on one of these charges. Usually private banks give loans up to 85% of the ex-showroom price, whereas government-owned banks offer up to 85% on the on-road price. However, these limits vary from bank to bank and also depend upon the creditworthiness of a customer. Before financing a car, the financier may look at your credit report to ascertain your creditworthiness. Also, the rate of interest on car loans offered by banks vary. Hence, while calculating your budget for your car financing options, it is imperative to take into account these two prices.